Martin Creed has said, “I don’t want to be a wanker.” He’s self-conscious about that, not being a wanker. I’d say he succeeds about 50/50. That’s actually pretty common, close to the national average, which includes you and your family and friends—all wankers, some of the time. Anyway, it’s not all that bad. It’s a pretty good indication that you’re alive. You’re alive! And there are so many things to experience, so many sensations to be felt, that you’ve got to get your fill. Desire is a Hydra head; rub one out and two grow back. Sometimes you buy yourself something real special, a special treat. You bring it home and take it out of its box. You put it on your entertainment center or your hutch or whatever, plug it in and turn it on, and it’s seamlessly integrated into your home and a real reflection of who you are right now. Step back to admire it, yeah. When you go to throw away the cardboard box it came in, you notice that the box is immediately occupied again—by your cat, who will defend his new castle to the death. That’s what Martin Creed’s art is about: having a play-date with yourself despite the other people in the room. Desire is a needy pet. Sometimes it’s that thing you have to feed. 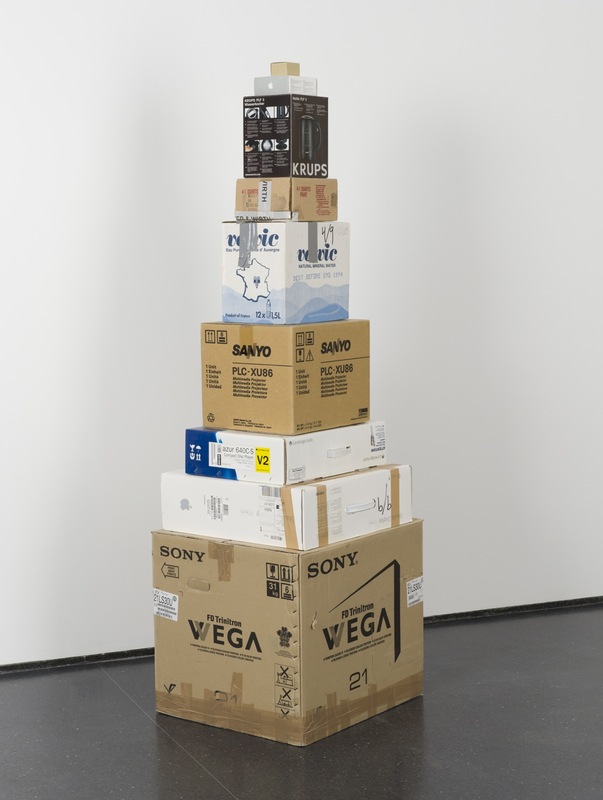 Often there are folks standing around Martin Creed’s stacked-box sculpture (Work No. 916, 2008), pointing and laughing, and waving over their wives and sisters to laugh at it too. Your comments would make the artist cringe except the artist would be the first to say, “I don’t know what art is.” (He has said that exactly.) Here’s an art history lesson: People often ask how much art costs. If it is made from gold, it will be more expensive. Empty cardboard boxes, perhaps less so. Old art means you encounter beauty. New art means you encounter thoughts. All the beautiful things you want to have. All the ugly things are important. All the stupid things are true. Published by the Museum of Contemporary Art, Chicago, and distributed as a free newspaper in their galleries.